We’d love your help. Let us know what’s wrong with this preview of The Cow That Went OINK by Bernard Most. A cow that oinks and a pig that moos are ridiculed by the other barnyard animals until each teaches the other a new sound. To ask other readers questions about The Cow That Went OINK, please sign up. For Valentine's Day one year, I painted a big shipping box to look like a barn and put in it a plush cow and a pig and this book, and gave it to my then two-year-old son. Weird -- yeah, maybe. Smart -- yeah, definitely. He likes the toys and the book, and all of his farm animals are now housed in the barn box. I first encountered this book in its oversized version when my friend and former colleague, Louise N., were looking for books for Reader's Theatre. We found this book, and since we already For Valentine's Day one year, I painted a big shipping box to look like a barn and put in it a plush cow and a pig and this book, and gave it to my then two-year-old son. Weird -- yeah, maybe. Smart -- yeah, definitely. He likes the toys and the book, and all of his farm animals are now housed in the barn box. I first encountered this book in its oversized version when my friend and former colleague, Louise N., were looking for books for Reader's Theatre. We found this book, and since we already had the pig and cow puppets, it was a cinch to use. The only challenging part was turning those oversized pages and working the puppets at the same time, but that's another story. Anyway, whether this story is being read to thirty five-year-olds or one two-year-old, it's a riot. Which makes it hold up really well for repeated reading and is one of my standards in buying a child's book. The title of the book tells about half the story, so I won't give away any more. It does have a happy ending, which is another one of my standards in buying a child's book, especially for a toddler. On the farm there's a cow that goes oink and a pig that goes moo. They get laughed at by all the other animals until they teach each other the sound they're supposed to make. This could be a good book for second language learners. The pig and the cow essentially teach each other to be bilingual. There's also a lot of fun onomatopoeia in the book for language teachers. And little ones learning the noises animals make will find a plethora of animals making noises in here. I liked this book due to the fact of all the noises that children can make to go along with this book. This book teaches, teamwork, respect, and also social and emotional issues. I feel this concepts are very important to implement in young children so that they understand how important it is to show respect, help out others, never make fun of or judge someone and how to express their feelings. I feel this book goes hand in hand with each of these topics. I would give the children a buck I liked this book due to the fact of all the noises that children can make to go along with this book. This book teaches, teamwork, respect, and also social and emotional issues. I feel this concepts are very important to implement in young children so that they understand how important it is to show respect, help out others, never make fun of or judge someone and how to express their feelings. I feel this book goes hand in hand with each of these topics. As the title implies, we have a cow, when she speaks, say "oink" instead of "moo", but to her chagrin! She's teases by the other animals of the barnyard until she meets a pig that say says "moo" instead of "oink". The pig is teased by the same barnyard animals, until they team up together to teach each other the "correct" sound. Then, they can speak both, and get the last laugh! 4 1/2 stars because of the topic of fitting in, teasing someone who doesn't fit in, and overcoming the obstacles that a As the title implies, we have a cow, when she speaks, say "oink" instead of "moo", but to her chagrin! She's teases by the other animals of the barnyard until she meets a pig that say says "moo" instead of "oink". The pig is teased by the same barnyard animals, until they team up together to teach each other the "correct" sound. Then, they can speak both, and get the last laugh! Ini bukunya lucu sangat, loh! Bahkan ketika membaca judul dan sinopsisnya udah bikin tertawa. Idenya nampak konyol. Jadi ceritanya di sebuah peternakan, ada seekor sapi yang bersuara "Oink." Tentu saja dia selalu ditertawakan hewan-hewan lain. Di sisi lain, ada juga seekor babi yang hanya bisa bersuara, "Moo." Ia pun bernasib sama seperti si sapi. Meski sudah bisa ditebak bahwa mereka akan saling membantu agar bisa bersuara dengan tepat, yang membuat cerita ini menarik adalah bagaimana penulis me Ini bukunya lucu sangat, loh! Bahkan ketika membaca judul dan sinopsisnya udah bikin tertawa. Idenya nampak konyol. Meski sudah bisa ditebak bahwa mereka akan saling membantu agar bisa bersuara dengan tepat, yang membuat cerita ini menarik adalah bagaimana penulis menggambarkan kedua hewan ini saling mengajari dan berlatih keras. Antara ingin ngakak sekaligus termotivasi sama semangat mereka. Beneran. Hihihi. Nah, menurut kalian, apakah sapi dan babi pada akhirnya bisa bersuara seperti sapi dan babi pada umumnya? Although the illustrations were captivating and the sentences were simple, I didn't really enjoy this book. I didn't like the plot. I didn't like the idea that the two animals who were different were being laughed at. Another funny book about a confused cow. Simplistic, may be better for my toddlers. Also, I won't use in tandem with the other Most cow book - they are very similar, and my kiddos seemed a little bored. The animal laughs were kind of awkward to sound out but Colin enjoyed it. I'm not a fan of the illustration style, but the simple text and nice message get 3 stars. I just love this book! It's just delightful and super for to try and readaloud to children! The Cow That Went OINK is a heartwarming book about accepting yourself as you are, and learning that being different from the crowd is okay. 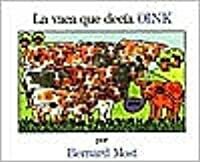 The book begins with a cow who can only say OINK, not MOO like the other cows, and because of this he is isolated from the other cows. Soon after, he meets a pig who can only say MOO, which isolates him from the other pigs at the farm as well. During the course of the story, the cow and pig become friends and after many trials and failed attempts, finally t The Cow That Went OINK is a heartwarming book about accepting yourself as you are, and learning that being different from the crowd is okay. The book begins with a cow who can only say OINK, not MOO like the other cows, and because of this he is isolated from the other cows. Soon after, he meets a pig who can only say MOO, which isolates him from the other pigs at the farm as well. During the course of the story, the cow and pig become friends and after many trials and failed attempts, finally teach each other how to say their "native sound" which allows them to interact with their same species. However, this particular cow and pig are special because they now have the ability to speak two languages, both MOO and OINK. In the end, the animals come to accept each other as part of one community-their farm. Four and a half stars really! Helena brought this home from her school library. It is really a charming tale about a cow that can only oink and a pig that can only moo. The other animals on the farm laugh at them, so the cow teaches the pig to oink and the pig teaches the cow to moo. They become the only two on the farm that can speak more than one language! The pictures are straight forward and plain, just as they need to be. Rhu (the toddler) LOVES it for all the animal sounds he gets to hear a Four and a half stars really! The pictures are straight forward and plain, just as they need to be. Rhu (the toddler) LOVES it for all the animal sounds he gets to hear and try to repeat. Bea (preschooler) loves the interaction of all the animals and Helena (kindergarten) is just grasping the story and its deeper meaning of kindness, friendship and shared experiences. I love it because it entertains all three at one time (and frankly, it's fun when the cow tries to moo and the pig oink). The only problem is going through ALL the animal sounds. After the second time, it's a little boring for Mommy; otherwise, it would have been a five star!! In this story, a cow gets made fun of because she can only say "OINK" instead of "MOO". She gets teased by all of the other farm animals, but one day hears a friendly "MOO". But instead of it being from a fellow cow, it is from a pig who cannot say "OINK". These animals befriend each other and teach the other to be able to say their words. Pretty soon, both animals can say "OINK" and "MOO" and tease the others on the farm for not being able to say more than one word. 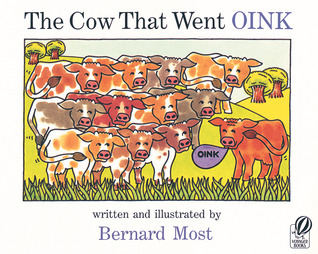 This books is meant to teach In this story, a cow gets made fun of because she can only say "OINK" instead of "MOO". She gets teased by all of the other farm animals, but one day hears a friendly "MOO". But instead of it being from a fellow cow, it is from a pig who cannot say "OINK". These animals befriend each other and teach the other to be able to say their words. Pretty soon, both animals can say "OINK" and "MOO" and tease the others on the farm for not being able to say more than one word. This books is meant to teach children that it is okay to not be the same as everyone else and that they can be different. It also lets them know that if they try hard enough, they can accomplish anything. Fun story for young readers about silly barnyard animals. My kid loved this and I didn't mind reading it over again. This review has been hidden because it contains spoilers. To view it, click here. 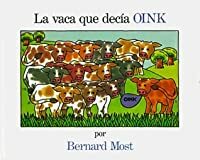 I think this book it is interesting.This book talks about one cow went OINK,other animals laugh her,and she was very said.One day, this cow saw a pig the pig went Moo,other animals laugh she too,and she was very said. so the cow and the pig become a good friend .One day, the cow has one idea:the cow teaches pig went OINK and the pig teaches cow went MOO.At the end,this cow and this pig is only can say two language's animals. 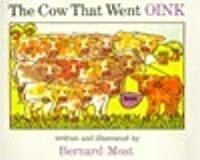 this book tell me ,if you saw the some people is no't same for we you I think this book it is interesting.This book talks about one cow went OINK,other animals laugh her,and she was very said.One day, this cow saw a pig the pig went Moo,other animals laugh she too,and she was very said. so the cow and the pig become a good friend .One day, the cow has one idea:the cow teaches pig went OINK and the pig teaches cow went MOO.At the end,this cow and this pig is only can say two language's animals. This book is about what happens when a cow says OINK and a pig says MOO, and it's not what you think. It's funny, but also sad, because all the other animals make fun of them. But you know what? They teach each other how to speak the right languages and now they can speak TWO languages. And you know, that could be really useful when they need to talk to other animals. They could be interpreters. So I think the other animals were just jealous, and maybe instead of making fun they should've tried This book is about what happens when a cow says OINK and a pig says MOO, and it's not what you think. It's funny, but also sad, because all the other animals make fun of them. This is an adorable story about a cow that speaks pig, and a pig that speaks cow. Unfortunately the other farm animals make fun of them, so they help each other to speak their proper language and end up with the last laugh. An excellent book to teach your children why it's not okay to judge those who are different from us. Also, an easy beginner reader that my first grader enjoyed reading to his brother. This book was about cow that oinked and always got laughed at by all the other animals. He runs into a pig that moo'd and they teach each other how to moo and oink. When they finally learned they showed the other animals how happy they were that not only could they do what they were supposed to be able to do, but they could make another noise also. I would use this to show children that people may do things they can't help and that they shouldn't be made fun of because of it. It was fun to read this book again after so many years. This book is a fun one with a nice heartfelt story. I think its great that they used farm animals to tell a story like this one. Just because someone might be a little different than you are, does not mean that you should laugh at them. And through friendship and hard work they actually had the last laugh. a cow that oink and pig that can moo become friends when all the other animals on the farm make fun of them. They teach one another to make the other's sound. How will the other animals react? really liked the friendship that emerged against the teasing of other animals. Cute but speech bubbles and length gear it toward preschool. Bernard Most is an author of children's books, especially books about dinosaurs. He lives in Westchester County, New York with his wife, two cats, and many fish.